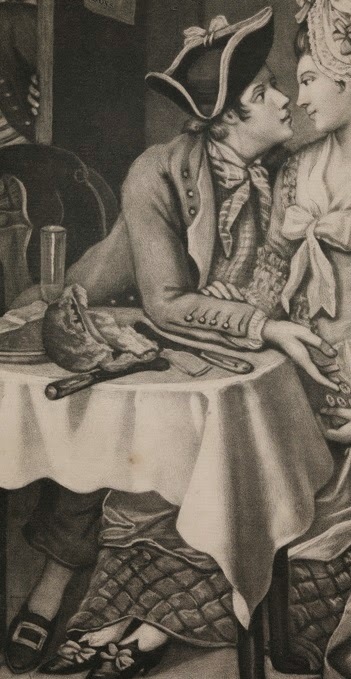 Bachelor's Fare - or Bread and Cheese with Kisses, John Collet, 1777, National Maritime Museum. A dolled up bachelor mariner hands a few coins to his lady while leaning in for a kiss. His knowing shipmate stands in the doorway, stealing a glance and putting a knowing finger to his nose. Behind the bachelor hangs a print of two ships fighting in close action, entitled "The Free Briton closely engag'd with the Charming Sally." The bachelor wears a black cocked hat bound in tape. Our sailor's cockade matches the color of the tape, though the exact color is indeterminate. His hat is cocked over the left eye, rather than the usual right, though this might have been done to give the viewer a better view of the bachelor's face. His hair appears to be a bit longer, possibly tied into a short queue. The tar's neckcloth is a striped fabric, tied loosely at the neck. It appears that he is not wearing a waistcoat, but a checked shirt. His jacket is possibly double breasted, but his left is hidden from view. The buttons appear to be metal, including those at the slash cuffs. The bachelor's trousers end well above the ankle. They are of a far darker than the white stockings he wears. His shoes are pointed toes, and his large buckles are rectangular. His shipmate in the doorway wears a simple black cocked hat with no cockade. Notably, his hair is curled rather than loose, though whether or not he wears a queue is pure speculation. This jack's neckcloth is a spotted , light colored fabric, tucked into his waistcoat. The waistcoat itself is horizontally striped, and single breasted with metal buttons. His jacket is double breasted and without a collar, and darker than the bachelor's. Like his shipmate, this sailor's cuffs are slashed with five buttons. Unlike his mate, this tar wears a pair of slops, as can be seen with the single large button at his waist. The slops appear to fit over the waistcoat, unlike other images which show the waistcoat on the outside.